The Peter G. Peterson Foundation (PGPF), like the equally wrong, Committee for a Responsible Federal Budget (CRFB), continues to broadcast economic nonsense, the purpose of which is to widen the Gap between the rich and the rest. At $21 trillion and rising, the national debt threatens America’s economic future. Here are the top ten reasons why the national debt matters. I. The national debt is a bipartisan priority for Americans. Nearly three-quarters of voters (71 percent) agree that the national debt should be a top-three priority for the country, including 69 percent of Democrats, 68 percent of Independents and 79 percent of Republicans. The above is not a reason why “national debt matters.” It merely is the result of polling Americans who do not understand the economics of Monetary Sovereignty, and who mistakenly believe federal finances are like personal finances. The so-called “debt” isn’t what most people think it is. It is ‘’DEPOSITS’‘ into T-security accounts. When you (or China) “lends” to the federal government, you take dollars from your checking account and deposit them into your T-security account. These accounts are similar to bank savings and CD accounts. Then, to pay you back, the government sends your dollars from your T-security account back to your checking account. It’s a simple money transfer the Treasury does this every day as T-securities mature. Banks boast about the size of their deposits. They don’t call them “debt,” though deposits are a form of debt. Before maturity, your dollars remain in your T-security account. The government has no use for them, since the government creates new dollars, ad hoc, every time it pays a creditor. 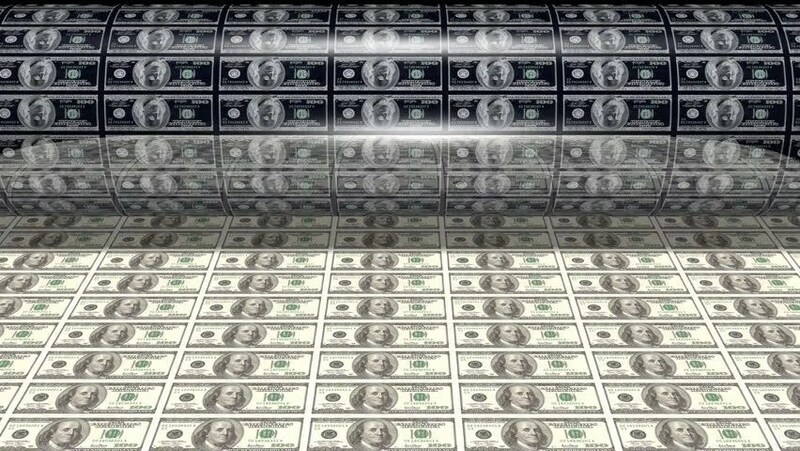 The U.S. federal government, being Monetarily Sovereign, never can run short of its own sovereign currency. Even if all federal taxes were $0, and no T-security dollars were accepted, the government could continue spending forever. The purpose of federal taxes is different from the purpose of state and local taxes, which supply state and local governments with money. The federal government neither needs nor uses tax dollars. It destroys them upon receipt. The real function of tax dollars is to control the economy, so “desirable” things are encouraged by being taxed less than “undesirable” things. 2. To help the Fed control interest rates, which helps control inflation. II. The return of trillion dollar deficits. The Congressional Budget Office (CBO) projects that the budget deficit will rise from $779 billion in 2018 to $1.5 trillion by 2028, resulting in a cumulative deficit of $12.4 trillion over the 10-year period from 2019 to 2028. “Reason” #II also is not a reason why federal debt matters, unless one believes all large numbers matter. Like the CRFB, the PGPF loves to quote big numbers without explaining why we should be concerned about them. Deficits merely are the difference between federal taxes collected and destroyed, vs. the federal spending that grows the economy. There is no reason why we should be concerned about the federal government’s spending that helps grow the private sector. The PGPF quotes a big deficit number to make you think that, like you and me, the federal government can have difficulty paying large financial obligations. But the federal government is not like you and me. Nor is the federal government like state and local governments. Being uniquely Monetarily Sovereign, the federal government never can run short of dollars. Never. Federal deficit spending grows the economy. In fact, when federal deficit spending is too low, we have recessions and depressions. And how are recessions and depressions cured? With increased deficit spending. The more interest dollars the federal government pumps into the economy, the healthier is the economy. Declining deficit growth leads to recessions (vertical bars) which are cured by increasing deficit growth. Federal interest payments stimulate economic growth. IV. Key investments in our future are at a risk. In addition, growing federal debt reduces the amount of private capital for investments, which hurts economic growth and wages. A nation saddled with debt will have less to invest in its own future. Growing federal “debt” increases the amount of private capital for investments. The so-called “debt” is related to federal deficit spending, which adds growth dollars to the economy. Additionally, growing federal debt requires growing federal interest payments, which also add growth dollars to the economy. V. Rising debt means lower incomes. Based on CBO projections from last year, growing debt would reduce the income of a 4-person family, on average, by $16,000 in 30 years. Stagnating wages and growing disparities in income and wealth are very concerning trends. The federal government should not allow budget imbalances to harm American citizens. There is no economic mechanism that would cause rising federal “debt” to reduce incomes. The additional stimulus dollars that increased federal “debt” produce, would stimulate higher incomes, not lower. VI. Less flexibility to respond to crises. On our current path, we are at greater risk of a fiscal crisis, and high amounts of debt leave policymakers with much less flexibility to deal with unexpected events. If we face another major recession like that of 2007–2009, it will be more difficult to work our way out. Once again, the Peterson Foundation demonstrates abject ignorance of economics or intentional deception about economics. Take your pick. “Reason” VI assumes that the federal government can run short of dollars with which to “deal with unexpected results.” Fact: Our Monetarily Sovereign federal government, never can run sort of U.S. dollars. Since 1940, the federal debt has increased from $40 billion to $20 trillion, a gigantic 50,000% increase. Yet the government never has lacked “flexibility” in dealing with unexpected events. During the Great Recession of 2008, the federal government ran massive deficits to grow us out of the recession, and it continued to run deficits every year, thereafter. No lack of flexibility occurred. VII. Protecting the essential safety net. Our unsustainable fiscal path threatens the safety net and the most vulnerable in our society. If our government does not have sufficient resources, these essential programs, and those who need them most, could be put in jeopardy. “Unsustainable” is a favorite word of the deficit Henny Pennys. No one can explain how our Monetarily Sovereign government can find debt or deficits unsustainable. Once again, the Peterson Foundation tries to tell you that the federal government, like state and local governments, can run short of U.S. dollars. To put it a charitably as possible, it’s a damn lie. VIII. A solid fiscal foundation leads to economic growth. A solid fiscal outlook provides a foundation for a growing, thriving economy. Putting our nation on a sustainable fiscal path creates a positive environment for growth, opportunity, and prosperity. With a strong fiscal foundation, the nation will have increased access to capital, more resources for private and public investments, improved consumer and business confidence, and a stronger safety net. In Peterson-speak, “solid fiscal foundation” means cutting deficit spending, i.e austerity, the program that always, always, always lead to recessions and depressions. IX. Many solutions exist! The good news is that there are plenty of solutions to choose from. The Peterson Foundation’s Solutions Initiative brought together policy organizations from across the political spectrum to develop long-term fiscal plans. Each of those organizations developed specific proposals that successfully stabilized debt as a share of the economy over the long term. “Many solutions exist” is not a reason why “National Debt Matters.” We can only assume this so-called “reason” was included to get the magic number up to 10. We feel quite confident that any “solutions” put forward by PFPG will accomplish just one thing: They will widen the Gap between the rich and the rest. X. The sooner we act, the easier the path. It makes sense to get started soon. According to CBO, we would need annual spending cuts or revenue increases (or both) totaling 1.9 percent of GDP in order to stabilize our debt. If we wait five years, that amount grows by 21 percent. If we wait ten years, it grows by 53 percent. Like any debt problem, the sooner you start to address it, the easier it is to solve. Again, number X isn’t a reason, nor are annual spending cuts or revenue increases a solution to anything. The rich always favor spending cuts, particularly to social programs the benefit the non-rich: Social Security, Medicare, Medicaid, aid to education, poverty aids, etc. And tax increases are welcome, so long as they are increases in the taxes the non-rich must pay: FICA and taxes on Social Security benefits. You seldom will see Peterson recommend increases in taxes on capital gains or on the tax loopholes the rich love. The Peter G. Peterson Foundation is just another right-wing, pro-rich organization that masquerades as a non-partisan think tank. Its goal is to widen the Gap between the rich and the rest of us. Federal finances are not like personal finances or state and local finances. The federal deficit and debt neither are a threat to the federal government nor burden on taxpayers. The federal deficit is necessary for economic growth. The federal debt could be paid off, tomorrow. The public’s ignorance about Monetary Sovereignty allows the PGPF and the CRFB to spread misinformation about the federal debt and deficit.